Ford Motor Company’s vehicle factory spans over 5,464,000 square feet in area. This landmark manufacturing plant occupies the same site as, and combines, the former Ontario Truck plant and Oakville Assembly Plant. Clearly visible from the Queen Elizabeth Way and the Lakeshore West GO Train line, it relies heavily on the nearby railway service to reliably transport countless parts and vehicles throughout Canada. The first car plant on this site opened in 1953 and produced nearly all of the vehicles for Ford in Canada until 1966. It was the site of production for the company’s minivans mainly but was ultimately renovated with a $1 billion investment to produce crossover CUV’s. In addition to 2,500+ human workers, 440 robots work 24/7 to help assist in the production of new vehicles. Over 211,000 new vehicles are manufactured and assembled at this facility annually. As part of Ford’s ongoing upgrades to the facility, the construction of three brand new 360,000-gallon storage tanks on a large mat foundation was required for a batch reactor treatment plant, where industrial wastewater was to be stored and treated. Part of the challenge was that the plant was situated directly adjacent to their existing painting facility, so it was critical that there was minimal disruption to the nearby structure. To further complicate matters, subsoil conditions consisted of 0-3m of loose variable granular fill, and 3-4m firm, becoming stiff clay till, with groundwater at 2m. The soil conditions, along with heavy loads, groundwater and the close proximity to the existing operating facility made dig replace very difficult as well as prohibitively costly. Ultimately, the Rammed Aggregate Pier® System, using the GP3® installation method was selected to be installed as close as one (1) metre from the existing paint facility to support the heavily loaded raft foundation. Additionally, unforeseen obstructions were dealt with ease by being able to adjust the position of Rammed Aggregate Pier® elements. Continuous plant traffic in close proximity to the work area resulted in a relatively tight workspace to complete the work, however, the installation of the Rammed Aggregate Pier elements did not disrupt plant traffic and operations and proved a cost-effective and practical alternative to dig-replace. Geopier design methodology involves a full-scale Modulus Load test on site to demonstrate the high stiffness that results from Rammed Aggregate Pier installation. The pier stiffness is predicted from a database of over 10,000 load tests and then checked on site with a full-scale load test. Tanks of this type are large, and the tanks are full of product, meaning the load is real and the load carries deep into the ground, creating the potential for large long-term settlements. The good news is, flexible tanks can often be designed for higher total settlements, provided differential settlements are controlled sufficiently to ensure that the tanks perform as intended. 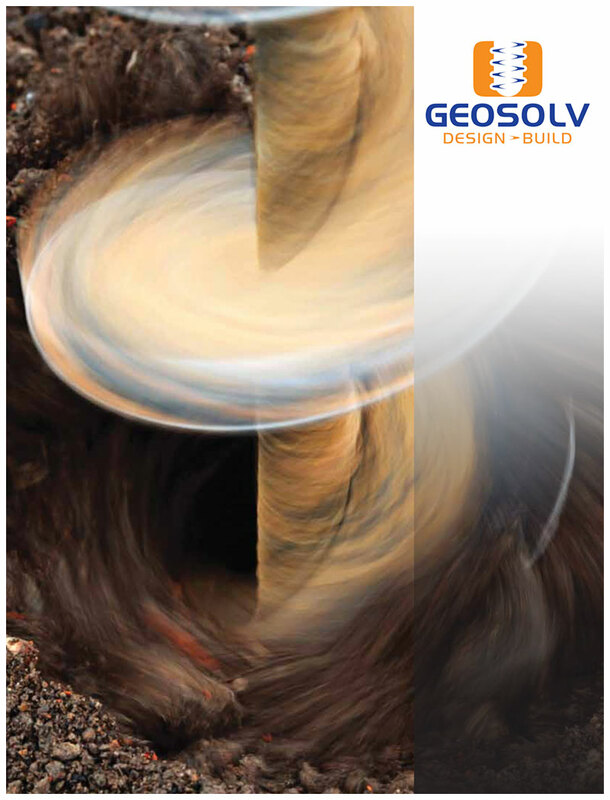 The biggest benefit on the Geopier approach for this and other tank projects completed by GeoSolv is the ability of the system to “engineer out” differential settlements within naturally variable soils and the varying pressures that occur under a group of tanks. The way a Geopier system can achieve this is through the use of customized spacings and depths to improve the soils on the local scale such that, globally under the entire tank raft, the potential for differential settlement is significantly reduced. Testing on site proved the design worked for 2” of total settlement and 1” of differential on a site which would have otherwise yielded much higher total and differential settlement due to the poor and variable soils present. GeoSolv Design / Build Inc.
100% Canadian Owned and Operated Copyright 2018 GeoSolv Design / Build Inc. All rights reserved.